Toyota Camry (VX70) – it is grace and premium comfort in one car. It is deservedly named one of the most popular cars in more than a hundred countries of the world. Camry has received such fame thanks to the attention of developers to advanced technologies and fidelity to values ​​of concern Toyota. On the site rental.ua you can rent a Toyota Camry (VX70) of 2018 for a period of one day. Contact us at any time - we work 24/7. At the same time, all cars are already insured, equipped with Wi-Fi, and the driver is provided assistance on the road on any issues and emergencies. The new Camry is built on a platform called Toyota New Global Architecture (TNGA). New technological solutions made it possible to make the car body more rigid and reduce the car's clearance to 145 mm. Thanks to the updated rear suspension and shock absorber struts, the Camry VX70 has a remarkable handling and smooth ride that you never tire of enjoying. 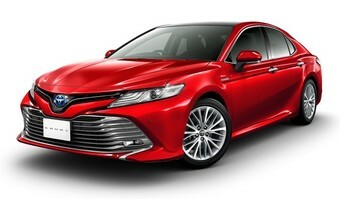 Camry, presented on our website, has a 2.5 2AR-FE engine (181 hp), as well as a 6-band automatic transmission. those who visit Kiev on business matters. All its appearance hints that you have a premium car. In the Camry of 2018, it became noticeably more spacious and quieter. The driver's seat is now noticeably ergonomic and thanks to the understated hood line and the new steering wheel, the road ahead is better to be seen. A new central console also adds comfort with a convenient 8-inch control screen, heated driver's and passenger seats, dual-zone climate control. And the instrument panel now has a 7-inch display. If you like to travel with your favorite music in its best sound, then the good news for the Toyota Camry (VX70) driver will be professional acoustics JBL - it's 9 speakers and a powerful subwoofer. Need to take a lot of things with you? The volume of the trunk of this car was 428 liters, where everything you need for your trip will fit. Rent Toyota Camry (VX70) in Kiev at an affordable price - it's RENTAL.UA. Enjoy all the privileges of our rental service on every trip! You can book your car online; all current prices are listed in the table above. We offer our loyal customers a profitable loyalty program. Call us for more information.